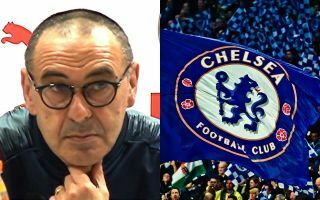 It seems a number of Chelsea fans have not taken well to the comments of manager Maurizio Sarri following the 2-0 defeat to Arsenal yesterday. Goals from Alexandre Lacazette and Laurent Koscielny gave the Gunners all three points in what was a fairly comfortable victory in the end at the Emirates Stadium. Sarri started well at Stamford Bridge before a recent dip, with Chelsea now not looking at all convincing as a top four spot is surely the best they can hope for by the end of the campaign. Fans will be disappointed not to see more of an improvement in Chelsea since Sarri came in to replace Antonio Conte after last season’s hugely disappointing season in which they finished 5th in the Premier League. Still, it seems Chelsea fans don’t have any sympathy for Sarri as he seems to encounter the same problems Conte did in terms of motivating this group of players. This suggests it really could be the players more than the managers, but despite BBC Sport quoting the Italian tactician as slamming his team after the Arsenal loss, these fans have hit back at the manager. How does Sarri expect his players to be motivated to perform if they know they’ll start the next game regardless? He’s every bit as responsible for this mess as the team. "This group of players are extremely difficult to motivate." That was Maurizio Sarri's reaction in his post-match press conference. Pathetic! Absurd!! and disgraceful to hear this from any manager. Sarri been in the job for 6 months now yet idiots telling me 'Rome wasn't built in a day'. Every passing game shows how clueless he is, no tactics, all we do is pass the ball around without any fluidity. When a man is clueless he starts blaming his working tools.. What nonsense is Sarri talking about? Alonso – better as a sub.